Alie Caldwell is a PhD candidate at UCSD, studying neuroscience, specifically a type of brain cell called an astrocyte. She goes by Alie Astrocyte on the internet, on places like Twitter and YouTube, where she and her partner Micah co-created and run an educational YouTube channel called Neuro Transmissions. Their channel covers a wide variety of topics, from basic brain questions to complex disorders and even exploring how current neuroscience research might be linked to certain sci-fi phenomena. Find her on Twitter (@alie_astrocyte) and on her website. SYNAPSE SCIENCE: Hey folks! I'm Alexa Erdogan, and today on the show we're chatting with honestly, one of my favorite neuroscience people. Alie Caldwell is a PhD candidate at UCSD, studying neuroscience, specifically a type of brain cell called an astrocyte. She even goes by Alie Astrocyte on the internet, on places like Twitter and YouTube, where she and her partner Micah co-created and run an educational YouTube channel called Neuro Transmissions. Their channel covers a wide variety of topics, from basic brain questions to complex disorders and even exploring how current neuroscience research might be linked to certain sci-fi phenomena. SYNAPSE: Thank you, Alie, for coming onto the show today! ALIE CALDWELL: Yeah, thanks for having me! SYNAPSE: So right off the bat, as a fellow neuroscience nerd, I have to ask - why neuroscience for you specifically? ALIE: Oh, that’s a good question. You know, when I was a kid - whenever I talk about how I got into science - it was actually through astronomy. I really fell in love with space and sort of these vast questions about the nature of the universe. And it was really kind of by chance that I had to take a humanities course during my first year of undergrad, and I took an introduction to psychology class and just thought it was so fascinating, and especially learning about particular patients in the history of neuroscience and psychology - so like Patient HM, Patient Tan, … - and just how incredible it was that, you know, a hit to the head or a brain surgery could have these dramatic effects on people and their lives. And sort of from there, I started taking more classes in the field and just taking more neuroscience courses, and really just decided I wanted to focus on the universe within, I guess, rather the universe around us. ALIE: [laughter] Yeah, I mean I think that - I think it’s sort of two different approaches to addressing similar questions, right? I think a lot of what drew me to astronomy as a kid and as a teenager was sort of this question of how do we fit in the universe and where do we come from. And I think that neuroscience is in some way seeking to answer those questions from a different perspective, which is to better understand how do we understand the universe, right? How do we even ask these kinds of questions? And how is it even possible that we can even build telescopes to look out at the stars? SYNAPSE: Yeah, I love that. I just stumbled onto a field specifically combining the two - space neuroscience - and I hear people referring to it as the final, final frontier, you know? ALIE: [laughter] So is it the neuroscience of our brains in space? ALIE: Okay! [laughter] So understanding how it’ll be when we eventually go on our long, long journeys? SYNAPSE: Mm-hmm. Yeah, like to long-term exposures to space radiation and all the psychosocial factors, as well. So yeah...and now you study astrocytes, is that right? SYNAPSE: [laughter] Well, I’m a fellow glial fan, so...I did glia research when I was an undergrad, so I am totally biased when it comes to this. I think astrocytes are awesome. ALIE: Yeah! Astrocytes are awesome. I always joke, I say, “Glorious glia!” I think Ben Barres sort of coined that term, but yeah I mean, I study astrocytes and their roles in development. So I just think it’s so exciting because….I like to say that, if neurons are the Beyoncé of the brain - you know they’re the superstars who get all the attention (and rightfully so because obviously, they’re the cells that keep us walking and talking) - but if neurons are the Beyoncé of the brain, you could sort of think of glia as being like her entourage. So they’re basically the support cells that help keep neurons functioning properly. And for a long time, we sort of assumed that all of these glial cells, which make up about half the cells in the brain - which is a lot of cells [both chuckle] - we thought that they were just there to be scaffolding for neurons. And in the last 20 years or so, especially, we’ve really started to understand that it’s not so simple. And all of these different glial cells play really critical roles throughout the lifespan: in neuronal development, in the formation of synapses and connections in the brain, as well as in maintaining the brain through our life, and then seem to be playing important roles in aging, too. So they’re really involved every step of the way. And my lab is specifically interested in understanding their roles at the synapse, so at these connections between neurons - how are these glial cells, and in particular astrocytes, how are they influencing the ways that neurons form connections with one another and how those connections develop and change over time? ALIE: Yeah, I like to joke that we’re sort of like the conspiracy theorists in the neuroscience community. You know, we’re like the Aliens guy from the History Channel? ALIE: Because we’re out saying like, “No, for real! They’re really important!” And you know, some people are starting to listen, but a lot of neuroscientists still have to be convinced. Astrocytes actually kind of came um...kind of not even, not even by accident, but it was sort of - it wasn’t that I necessarily went looking for astrocyte research as much as it was that I kind of knew myself by the time I got to grad school? I had spent time doing research as an undergrad, and I had also spent time doing research between undergrad and graduate school. And I had a really difficult time as an undergrad at MIT. I had a hard time socially and just really didn’t feel very connected to the community there? And so by the time I went to grad school, I knew that it was really important for me to find a community that I felt like valued me as a person, and part of that was finding a lab that I thought cared about me as a person and my development as a scientist, as well as the research that was being done in the lab. So I - my advisor spoke during our orientation session at grad school. In our program, we do rotations, so we don’t start at a lab right away when we join grad school. We actually spend time in different labs, getting a feel for what the lab’s like. And I went to grad school thinking I was going to work with a totally different PI, I thought I was going to study spinal cord injury, I had like this completely different idea of what I was going to study. And then I did a rotation with my advisor - my current advisor - and just really felt wanted and welcomed in the lab and really felt connected to the people there. So...you know, I did other rotations, but ultimately that was the lab where I felt like I was most wanted? And then it was also this moment of sort of really discovering glial cells, right? Where it was like, “Oh! These things are really cool, and we know so little about them.” And so I kind of think that we’re like, we’re with glial cells where we were with neurons like, 25 years ago. Right? Like, we’re just starting to understand how many different kinds of astrocytes there are. So, that to me is so fascinating, right? Like, it’s like we’re still on the frontier of all these questions that maybe have at least been addressed in neurons years ago that now we’re just starting to ask them about astrocytes and other glial cells. SYNAPSE: Yeah, I remember in undergrad, when I first started learning - that was the first time I ever heard about glia - and I remember the textbook described it as like, “If you imagine your brain as a cookie… [ALIE: laughs], then neurons are the chocolate chips and then the rest is glia. But in the past few years or so, I’ve been reading like new things where there’s way more - there’s a more equal ratio to glia and neurons, and some of that stuff is really interesting. Like, we’ll still learning so much about it that you would think we know all this by now, but it’s just fascinating. ALIE: Yeah, it’s not so simple. I think - I mean, I think it’s really fascinating. You know, we often cite the 86 billion neurons number as the number of neurons in the brain, but if you actually dig into that statistic, it’s based on one study that looked at four adult male brains post-mortem. ALIE: Soo...yeah, right? So it’s like, we cite this...we cite this study, but that study - while it was, you know, an interesting and good and important study - whether or not we can really generalize that 86 billion number to everyone’s brain...I don’t know. And I think a similar thing with glial cells, where yeah, we used to say, “Oh, it’s 90%.” And now it seems like, “Oh, maybe it’s 90% in some areas, but not in all areas.” And yeah, definitely just starting to figure some of those details out. SYNAPSE: Yeah, I think it’s definitely an exciting kind of frontier of research to be in. And I like that, too, that your story includes that human factor of the lab. Because I think - I think that’s really important, too. That’s totally how it happened with me, with my lab, too. I had no idea that I was ever going to end up doing any kind of glial stuff. SYNAPSE: And it’s just, you meet fascinating people who are just so excited about what they want to do and so passionate about it...and also really welcoming. And that can really draw you to science, you know? Whether you’re doing science, I think, or whether you’re just interested in science and people want to tell you about it. ALIE: Yeah, totally. Well, and I think it - it really helped that I kind of knew what I wanted in an advisor by the time I got to grad school. It can be so hard to know, right, like grad school is not at all what I thought it was gonna be. You know? 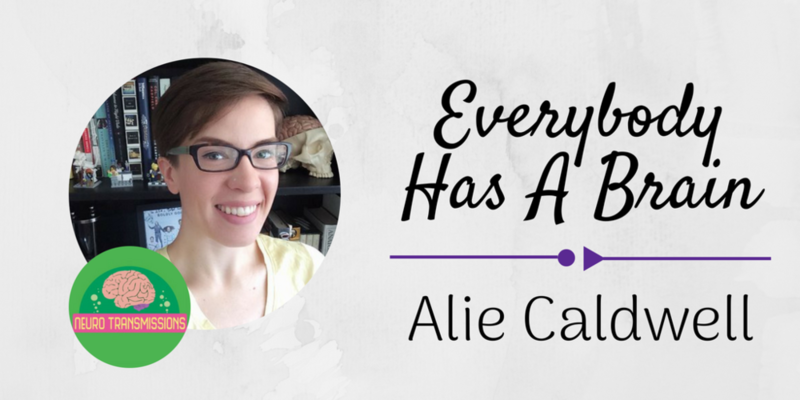 ALIE: I didn’t know what I was - because I’m the first scientist in my family. Like, my mom worked in retail, my dad was a cop. So while I’m definitely not a first-generation scientist, I am the first scientist in my family and didn’t really have anyone who could kind of tell me about the experience. And so, finding a lab where I have been able to learn as I go and not just feeling like the only thing that my advisor cares about is how much research I produce has been really valuable. SYNAPSE: Mm-hmm. It’s about the quality of interactions between people, between researchers. ALIE: Yeah, well and understanding that science is more than just the number of papers that you publish. Like, obviously, funding is important and publications are important, but science is not just as simple as cranking out the next paper and the next paper and the next paper. SYNAPSE: ...which recently passed 10,000 subscribers so congratulations for that! SYNAPSE: What inspired you to start up that channel and start making neuroscience videos? So, my partner and I had actually been doing film stuff for fun for a long time, him more so than I. So he made videos as a hobby all through college, and then after college, we did a couple of 48 hour film projects, which is this nation-wide event where over the course of 48 hours, groups compete by making a short film and they all have like similar elements - so it’s essentially this like very intense weekend of film-making. And then it kind of got like, mildly viral in the scientific community and so, sort of a bunch of people in my graduate program associated us with video. And then a friend sent me a link to the Society for Neuroscience BrainFacts.Org Brain Awareness Video Contest the following year, and he was like, “Hey, you should check this out and think about entering a video!” So Micah and I talked about it and... wrote a script and filmed a video and entered, and ending up winning 2nd place. And it was a lot of work, but it was also a lot of fun? So we started talking about well, what if we kept doing this? What if we made more videos like this? And eventually, it led me to develop essentially a syllabus, where I was like, “Well, let’s see if I can take the topics that you would learn in an introduction to neuroscience course, but instead of it being hour-long lectures, it’s 5 - 7 minute long videos that are broken down with animations to help make it easier to digest. So we started with that concept and then just kept building from there. And I don’t really know kind of at what point it just like, became the thing that we were going to do. But we’ve been really lucky and very grateful for the positive response from the community. ALIE: Yeah, we started sort of with a syllabus of you know, basic neuro topics, so like what is a synapse and brain anatomy, and how do we see that kind of stuff...and we found that people really like the basic neuroscience classes. A lot of our viewers are students who are studying, so I think people find it very helpful to sort of supplement their textbooks to kind of have these short videos that sort of uncover these topics. So lately, we’ve been doing a lot more sort of condition and disorder focused videos. So we did a video with our friend Cory from another YouTube channel called 12tone, and he’s autistic, so he helped us do an episode about autism. And like, I did a video about anxiety and I have anxiety, so I can talk a little bit about my personal experience with that. So when we can, yeah, one thing we’re trying to do is bring in actual people who have experiences with those conditions to talk about them - although it’s not always, easy, right? Like, some of them could be really hard to talk about. SYNAPSE: Yeah, totally. I like that, too, that you - I really appreciate the collaboration that you guys do, and the kind of mindfulness that you bring to covering these topics with enough care and also education to them. I think you guys do a great job of that. ALIE: Yeah, you know, we want to make sure that we’re fairly representing things, and you know, in the case of like autism, for example, like obviously that’s a very difficult conversation to have because autism is a huge thing, and it covers so many different kinds of experiences. So trying to make sure that we represent it as fairly as we can given the scientific literature, while acknowledging that the literature doesn’t necessarily include the perspective of people who are actually autistic and talking about that as sensitively as we can. SYNAPSE: What has been the most rewarding part, do you think, of producing these science educational videos, in particular? ALIE: Oh, that’s a good question. I have really enjoyed the positive feedback from students. I’ve really loved hearing from people who said that it really helped them study for a test or that they weren’t getting it because of their lectures, but after watching our video, it clicked into place. You know, just knowing that people are finding it to be a valuable resource? Because we set out to do something that at the time nobody else had really done, but we didn’t know if people would really care about it and so finding that people do care has been really wonderful. And it’s also been really great to hear from my peers. I mean, as a scientist, right, you want validation from your peers? And so I’ve also really appreciated the feedback we’ve had from other scientists who feel like we’ve done a good job of representing the science of different phenomena in the brain because it’s hard to break this stuff down into a short video. So it’s good to hear back from people when we’ve been successful. SYNAPSE: Yeah. Yeah, totally! I’m always continually amazed by how supportive and just diverse and varied the science community is, you know? Within like each field, especially like neuroscience, there’s so many cool neuroscience people out there. ALIE: Yeah! Yeah, I think that’s totally true. I think it’s especially true of sort of the younger, more connected generation of scientists. Which isn’t to say that there aren’t older scientists who are not well connected and who aren’t wonderfully supportive and kind and everything. But I have found the connections I’ve made through social media and through Twitter, in particular, in the scientific community to be so wonderful and supportive and very valuable. Because, you know, I have a great adviser, I have a great research project and a wonderful lab, but it helps to have other perspectives as you go through your scientific education and your career and just being able to connect with other people and to talk about all kinds of things, both my science communication outreach as well as my experience as a graduate student, has been really valuable. SYNAPSE: Conversely, what do you think has been the most challenging part of doing all this? ALIE: Oh, uh - well, the thing with video is it does not have to be very time-intensive, but the way that we have chosen to do it makes it very time-intensive. I’ve seen people who do really awesome and effective science communication using like short clips on Instagram, and I think that’s fantastic. We went the more heavily-produced, you know, professional style cameras and audio equipment style, which is great and I love it. But it’s very time-consuming. I kinda joke that it’s like our second - like, we basically have a second full-time job. So Micah and I, when we get home - I mean, most nights, we get home and you know, we have dinner and then we go to the office and we work until we go to bed. ALIE: Yeah, so that - that can be really rough, finding that work-life balance. We put out a video every two weeks, which would not be very much at all if we didn’t also have other full-time jobs and then a whole, you know, life [both laugh] on top of that. So I think that that is the most challenging. You know, I’ve been very lucky in that I have not - I mean, knock on wood - have not yet attracted the ire of too many trolls on the internet. So, we’ve been lucky to have relatively few negative comments so far. SYNAPSE: Yeah, I have to say, though - you can definitely tell there’s such a high production quality in the videos when you watch them. I get like a - a Crash Course vibe from them? Very often? ALIE: [laughter] Thanks! Yeah… Yeah, I mean the Vlogbrothers - it’s really funny, actually - the Vlogbrothers were a huge inspiration for us early on. I mean, my partner had a YouTube channel before we even did Neuro Transmissions, and I’m - I’m not gonna blow his cover and tell you what it was [both laugh]. But he used to do a channel about - about comic books, and some of that was inspired by the Vlogbrothers and their early work on the internet. And of course, the Vlogbrothers grew their YouTube empire into a number of channels, including Crash Course. And I’ve also written for SciShow a lot - actually, I think I just wrote my 50th script for SciShow. SYNAPSE: [laughter] Why - why do you think that science communication like this is so important to you personally, like both with Neuro Transmissions and also the science communication you do for other shows like SciShow or just on Twitter and stuff like that? ALIE: Yeah, well, it’s funny, you know - I mean, some of it is very selfish if I’m being totally honest. My grandma always said - it’s so funny because she now says, “I told you so,” - my grandma always said that I was a writer. And she wasn’t wrong. I’ve been writing my whole life, I did a lot of creative writing when I was younger, and would still like to - not that I have the time. But having the chance to write when we started our own videos and then later also writing for SciShow was just this really wonderful way to get to talk about my science and work on my writing at the same time. And the same thing with science, in general, to be able to be up there and say, “Hey, I’m a scientist and I’m a person, and I love my cats and I like to garden - but I also go to lab every day and study brains.” So that’s - that’s why it’s really important for me, is to be able to sort of help shape the way that people understand these things. SYNAPSE: You’re like a kaleidoscope of a person with so many different interests, you know? ALIE: Yeah! Yeah, totally, and I mean, so is everybody, right? ALIE: Like, no one is just their job. SYNAPSE: Yeah, absolutely, I agree with that. Personally, too, I have to - I have to mention [ALIE: laughs] some of the Star Wars videos that you guys have done [both laugh] on Neuro Transmissions. Because - like, The Science Behind Jedi Mind Tricks, Seeing Without the Force, Is Luke’s Robotic Hand Possible?, which will be linked in the show notes, as well, for people to check out. [ALIE: laughs] I love those kind of videos. How do you pick and choose which kinds of kinda sci-fi related videos that you want to produce? SYNAPSE: Mm-hmm. Star Wars: the gateway to neuroscience. ALIE: [both laugh] Yeah, the gateway drug to so much. SYNAPSE: Yeah. I love that episode, the prosthetic - Luke’s robotic hand episode - I thought that was really cool. It’s interesting to see how elements in science fiction have such comparable technology in today’s reality or can be explained in different ways using our current understanding of science. [ALIE: Mm-hmm.] Like, I’m such a nerd for the kind of videos on Youtube, like the science of Fallout 4’s stimpaks or something, or something weird in video games. [ALIE: Yeah.] Because it’s a cool way to kind of re-imagine and see the present in science fiction, you know? ALIE: Yeah, yeah… And I think - I think it is an opportunity to - I mean, I don’t know that we necessarily do this that much, but it’s an opportunity to also think critically about the science that we’re doing. Right? Like, it’s - it’s exciting to think about the possibility of Luke Skywalker’s prosthetic, but from there, you could then go on to think about like, well, what about the Star Destroyers? Like, what’s the science of the Star Destroyer, and how close are we to creating that? So sort of forward thinking about what we’re doing now and where that could eventually lead is also a very interesting topic for me. SYNAPSE: I’m interested in hearing how you feel personally about how science is portrayed in popular media, like in science fiction films, or books, or video games, or things like that. ALIE: Yeah, or there’s the like - yeah, there’s just a lot of variations on the nerdy scientist. And I think that - I mean, this isn’t unique to scientists, right, or any field, but sort of the one-dimensional portrayal of scientists can be frustrating, and of science, as well. You know, one thing that I think that media actually gets pretty well is - you know, that old line from Jurassic Park where Jeff Goldblum’s character, Ian Malcom, says, “You were so obsessed with whether or not you could, you didn’t stop to think of whether or not you should.” And I actually think that that perception is a fairly accurate representation of scientists, at least based on what I’ve been seeing and hearing in conversations lately. I think that scientists are not very adequately trained in the ethics behind the research that they’re doing and thinking about the long-term possible effects of their work. And I don’t think that scientists go into this with ill intention, but I do think that there’s a lot of - just sort of ignorance, right? Like, we as scientists think, oh well, I want to improve the world, and I’m going to build something really cool and something that’s gonna save lives, but we don’t think about like, okay, but what does that mean as that technology is expanded on? ALIE: Totally. Yeah, yeah. Like, I was just at a meeting where somebody was talking about the CRISPR-Cas9 technology that allows gene editing, and he basically had this perspective of like, this technology is so great because we’re going to be able to cure every disease. And...And I said, I was like, “Okay, but who’s going to decide what we cure and what we don’t?” And he was like, “Well, it’ll be - it’ll be fine because we’re just gonna cure diseases, we’re not going to make superhumans.” And I was like, “Yeah, but who gets to decide what’s a disease?” Like, are we gonna fix people’s near-sightedness? Are we gonna...fix people who are short? Like, what are we - what are we calling a stepback for people, and who decides what that is? SYNAPSE: Right, yeah. And especially, like...I know a lot of people who I’ve talked to in the neurodiverse community don’t see their conditions as, you know, a “disease” - it’s part of their identity, it’s part of who they are. And it would be very strange for somebody else to come along who doesn’t share that and you know, label different people based on their perspective of the world. ALIE: Yeah. I mean, it’s - it’s [exhale]. It’s a risky thing, no matter what because I feel like there are obviously grey areas, like you were just saying in the neurodiverse community, but we’ve been so obsessed with this idea of “normal” without ever stopping to think about, well, what do we mean when we say “normal”? And who decides what normal is, and why do we all have to be normal anyway? SYNAPSE: Yeah! From the outside - because I’ve heard this so many times when somebody I hear tells somebody else that they’re a neuroscientist or that they study the brain (I get it really often, too, when people ask me what I used to study) - from the outside, neuroscience can seem like such a daunting and challenging field. People feel instantly kind of - I don’t want to say “averse” to it, but kind of taken aback by it in a way? [ALIE: Mm-hmm] And if someone was interested in studying neuroscience but felt overwhelmed or didn’t know where to start, what kind of advice would you give them? ALIE: Oh, that’s a good question. Yeah, no, you’re totally right. And I’m sure you’ve experienced this when someone says, “Oh, what do you do?” and you say, “Oh, I’m a neuroscientist,” and they’re like, “You must be really smart.” [SYNAPSE: laughter] It’s like, well, I mean, not - I mean, yeah, but only because I’ve been going to school for like 10 years, so... [both laugh] It’s not that I’m like, inherently really smart, it’s just that I’ve been doing a lot of education. For people who are intimidated by the idea of neuroscience, I mean, I come back to this point of everybody has a brain. And you have not only the right, but everyone has the ability to understand that on some level. Like even if it’s just to take a moment to think about how crazy it is that you are sitting there, thinking about your own brain...using your brain. That’s amazing that we can do that! And I think that neuroscience seems very intimidating because obviously, there’s so much caught up in that, right? Like, neuroscience is the science of...us! And of our personalities. But there are a lot of resources out there to get connected. And you know, you can start with something as simple as just trying to understand...you know, your grandfather’s Alzheimer’s or your cousin’s epilepsy. I mean, there are things that affect real people. Neuroscience is not just this like, ivory tower of scientists studying it - it’s stuff on the ground floor that people are living with. And so sort of thinking about it in that way and thinking about how it’s your brain and it’s just understanding yourself, I think could help people maybe not feel so intimidated. I mean, in practical - in practical advice, there’s so much great pop neuroscience stuff out there, too? I mean, there’s great books. Lately, I’ve seen a lot of great comics, so there’s like Neurocomic. First Second Comics is about to put out a science comic all about the brain that’s coming out later this year. And so there are people who are using this opportunity to blend visuals with writing to sort of help illustrate some of these harder-to understand concepts. SYNAPSE: That’s really cool! I hadn’t heard about that - that last comic - I gotta keep an eye out for that. ALIE: Yeah, it’s really fun! I wrote the introduction for it, so I had the chance to read it last fall and it’s going to be really great. It’s sort of targeting school aged students? But definitely, anybody would get a kick out of it. And it really covers a very broad view of neuroscience, I think it’ll be really great. SYNAPSE: Nice! Yeah, I look forward to seeing that when it comes out. SYNAPSE: Right! Yeah. I think that’s a very vital message, especially...like in recent events. Or in our current age of being. Yeah, and well I wish that we would address that issue with understanding just within science itself. You know, I gave a journal club presentation not too long ago, and I had a slide at the beginning of my presentation that said, “Here is every word I had to Google.” [SYNAPSE: laughter] Because it was all of this stuff that I didn’t know, and it was a field that was very close to my own! But it was like slightly more molecular biology focused than what I do, and so there were all of these things that I didn’t understand. And so it’s really hard to overcome that intimidation that you mentioned if you just can’t - if you can’t access it. So, I hope that by changing - and I’ve been talking to a lot of people about the need to change STEM education to improve communications training. And I think that there is a movement afoot to improve how scientists are trained in communicating their science. Because science communication - you know, we often talk about science communication and what we really mean is science outreach - science communication is something that every single scientist, even the most wrapped up in their lab coat in the lab every day scientist, needs to be able to do. You still have to be able to write papers, and apply for grants, and give talks, so...to provide more students in STEM with the training they need to talk coherently and clearly about their science to a variety of audiences I think will be very critical for science going forward. SYNAPSE: Yeah, I agree with that. I - I’ve heard some people talk about how not everybody who’s a scientist needs to be doing science communication, but I think that you’re right on that - when we talk about science communication, we usually mean active science outreach, you know, like podcasts or videos or articles or other forms of media or in-person engagement in schools. But I do think that...if you are going to do science and if you have a passion for it - which you know, most people do - I think you should be able to communicate what you’re doing to other people, if not you know, like you said for funding reasons or for professional academic reasons, to just be able to share that with other people...is such a gift, such a joy! ALIE: Yeah. Totally! I mean, not every person is going to love to talk about their job, whatever their job is. But if you’re in science - you know, like you said, I don’t think that every scientist is necessarily obligated to science outreach. But if your research is funded by the taxpayers, don’t you at least have the responsibility to be able to explain to a taxpayer what you’re doing with their money? And I - you know, and I recognize that like, not everybody wants to be blogging or doing museum volunteering or whatever, and that’s totally fine. But communication is a critical part of science because if you do the science and then never talk about it, nobody’s ever going to know! So yeah, I mean, communication training in general I think will be really important going forward. So... [both laugh] to help people understand what it’s like to actually be here in the lab and doing this kind of work I think is just so critical. The best scientific papers out there, in my opinion, are the ones that are super easy to understand right off the get-go [ALIE: laughter]. Or if they do require jargon..they have definitions of what those mean. [ALIE: Yesss.] And it’s fantastic. It’s like, I can just hear like, angelic choirs when I pick up the paper off my desk, you know? ALIE: [laughter] No, totally! And I think that - I mean, for me at least, I don’t know if other people agree with this - but for me, doing outreach has improved my communication in the scientific circles that I’m in. You know, I’m a better public speaker, I’m a better writer. And I think that that is true for a lot of people who do outreach, which again doesn’t mean everybody has to do outreach. But it’s not that they’re - they’re not mutually exclusive. SYNAPSE: Yeah, absolutely. Well, if people want to keep up with all of the science communication you do, where can they find you on the internet or get in touch with you? ALIE: Yeah, totally. You can find me on Twitter @alie_astrocyte, but I’m one of those obnoxious people who spells Alie weird. [both laugh] So it’s @ A-L-I-E underscore ASTROCYTE. You can also find us at neurotransmissions.science. You can find our videos and links to our work there. So yeah, I mean, come find me on Twitter. Twitter is where I’m at my goofiest, I think, and my most “this is what grad school’s like”. [both laugh] But you can find our YouTube channel if you want to learn more about specific topics in neuroscience and psychology. SYNAPSE: Thank you so much, Alie! SYNAPSE: Thank you so much for listening to this episode of the Synapse Science Podcast, and a big thank you to our special guest, Alie Caldwell. If you need links to her social media, resources on anything we talked about in this show, or a transcript for today’s episode, you can find them in our show notes over at synapsescience.com. As always, you can find us chatting about interdisciplinary and intersectional science over on the show’s Twitter @synapsepod. If you’d like to get in touch with the show for comments, questions, or anything else, you can email me at synapsepod@gmail.com. And if you like this podcast, let me know by giving the show a rating and a review on iTunes to help boost the show. Thanks so much for listening. I hope you enjoyed the episode, and until next time, have a wonderful week! Music tracks used in this episode are attributed to Komiku ("A Good Bass for Gambling") & Kevin MacLeod, the latter of which is licensed under Creative Commons: By Attribution 3.0 creativecommons.org/licenses/by/3.0/. The Synapse Science Podcast is licensed under a Creative Commons Attribution-NonCommercial-NoDerivatives 4.0 International License.